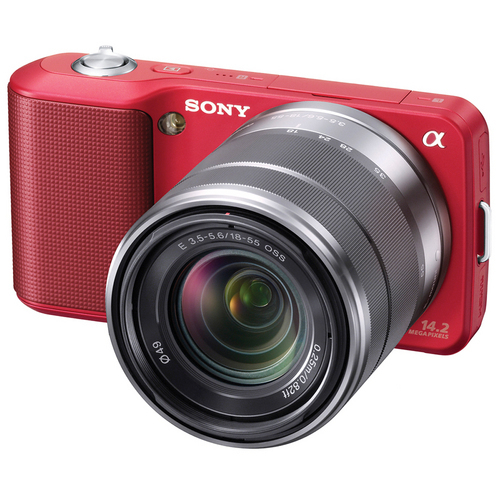 SAN DIEGO, June 8, 2011 – Sony’s new α NEX-C3 is the world’s smallest, lightest interchangeable lens camera with an APS-C sized sensor. The resolution of the camera’s large Exmor™ APS HD CMOS sensor is boosted to 16.2 effective megapixels, capturing stills and 720p HD video with breath-taking clarity. The large, DSLR-sized sensor also lets users produce pro-quality background defocus effects, whether shooting HD video or stills. The new NEX-C3 ultra-compact digital camera will be available this August in silver, black and pink with an 18-55mm kit zoom lens (model SEL1855) and will cost about USD$650. It will also be offered in black only with a 16mm lens (model SEL16F28) for about USD$600. The new SEL30M35 E-mount Macro lens will be available this October for about USD$250 and the HVL-F20S flash will be available this August for about USD$150. This entry was posted in Brand: Sony, Photography Articles & Videos, Uncategorized and tagged Alpha, Lens, Micro 4/3, Mirrorless, Sony. Bookmark the permalink.